(CNN) – A report by the conservative Heritage Foundation criticizing the Senate "Gang of Eight" immigration reform plan for being too costly wasn't an accurate assessment of the bill, one of the Republican lawmakers authoring the measure said Tuesday. The report, released Monday, takes particular issue with the Senate bill's pathway to citizenship for undocumented immigrants already living in the United States, saying such a route to legal status would cost taxpayers trillions. 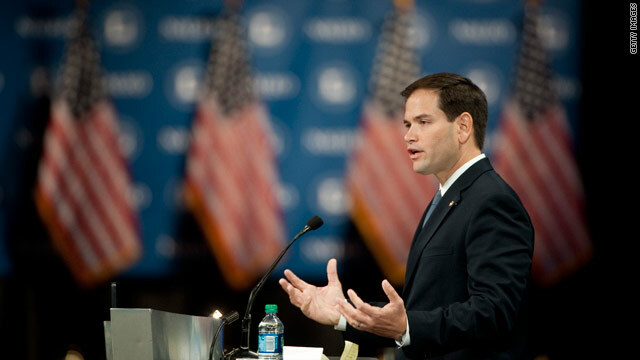 Sen. Marco Rubio, in an interview with CNN en Español's Juan Carlos Lopez, countered that improving the immigration system would actually help bolster America's economy. "I don't believe their report is really legitimate. I have a lot of respect for Heritage, but I don't believe their report is a legitimate one," the Florida Republican told Lopez. Creating a legal pathway for the 11 million undocumented immigrants in the country would cost taxpayers a minimum $6.3 trillion over the lifetime of those immigrants, according to the new Heritage report, which also argues the average undocumented immigrant is 34-years-old, has a 10th grade education, and receives $14,387 per household in government benefits in excess of taxes paid. Former Sen. Jim DeMint, who left Congress last year to head the Heritage Foundation, said at a news conference that "no sensible person could read this study" and conclude that the bill would have a positive impact. Comparing the bill to "Obamacare," DeMint chided comprehensive legislation and called instead for a "piece by piece approach." Rubio pushed back against DeMint's argument Tuesday, saying bringing undocumented immigrants into legal status would help strengthen the United States. "If they are legalized, they will be able to work and pay taxes, they'll be able to open businesses and in due time improve their financial situation and contribute to the country's wellbeing and not hurt the country," Rubio said. "So that's why I strongly disagree with that report." DeMint has previously acted as a mentor to Rubio, who was elected in 2010 with strong backing from the tea party and other grassroots groups. DeMint, then-senator from South Carolina, endorsed Rubio in the summer of 2009, bringing a national spotlight to the former speaker of the Florida House of Representatives. The support helped push Rubio ahead of incumbent Gov. Charlie Crist and on to the GOP nomination. But his new push for immigration reform has angered some influential conservatives, who equate a pathway to citizenship with "amnesty." Rubio has aggressively defended the bill on conservative talk radio and in op-ed pieces, saying the bill, as it stands, can be made better with more Republican input. On Tuesday, he'll meet with over two dozen grassroots conservative leaders in Washington, a Rubio aide told CNN. Most of the activists attending the meeting support immigration reform, the aide said. And later in the day, Rubio will join a conference call convened by the right-leaning Hispanic Leadership Network for its supporters to discuss immigration. CNN's Jim Acosta, Ashley Killough, and Paul Steinhauser contributed to this report. "This Heritage estimate is 50 (FIFTY YEARS). So divide the number by 50 and see what it is per 1 year." That's $12 billion a year. How about this: For 2011-2015, there are than $55 billion in targeted benefits for the U.S. oil and gas industry and nearly $23 billion in general business subsidies. Eliminate these and voila! Problem solved! P.S. I think the Heritage Foundation is pulling numbers out of its fanny, BTW, and the $6 trillion is just yet another Repub scare tactic ... from the folks who accuse President Obama of fear-mongering and playing emotions, no less ... what a bunch of losers! @Sniffit: "Obamacare was an idea originally from Heritage "
Your response is correct, yet it is worth noting that when Mittens signed his healthcare plan into law (which became the blueprint for Obamacare), Dr. Robert Emmet Moffit of the Heritage Foundation was standing right behind old Mittster, praising the law for establishing a new “patient centered” and “consumer-based” market where everyone can find affordable coverage. Ignorance is bliss, or so it is said. Thank goodness someone has thwarted this presidents agenda. Never mind they increase GDP. Increase tax revenues and lower debt, and while we are at it increase the minimum pay to $10 and if that increases the price of some agricultural and food products let that work its way across 360M people It's a peanuts effect but also GDP and consumer spending which 70 % of GDP in our economy. Problem: passing this ( immigration) legislation with minimal restrictions is a no brainer..... but in todays GOP" ideology rules" over brain power and intellect and common sense. want congress to be working on????? Americans will NOT pay for this Giveaway to illegals. The GOP are totally divided between stubbon old closet racists and angry young wealthy capitalists who care about one thing and one thing only – $$$! What a pathetic attempt at sounding pro immigration Rubio, ifg you really cared you wouldnt campaign for the GOP. A very sick state of politics. Over 12 million United States citizens are currently unemployed and The Gang if Eight want to flood the feeble job market with 30 million criminal immigrants. Where are we going to get the Trillions if dollars to enact this Amnesty bill? Paul (lyin)Ryan said the same thing. Deminted's report is a lie. 2014 comes quickly for the Guns Over People tea potty.